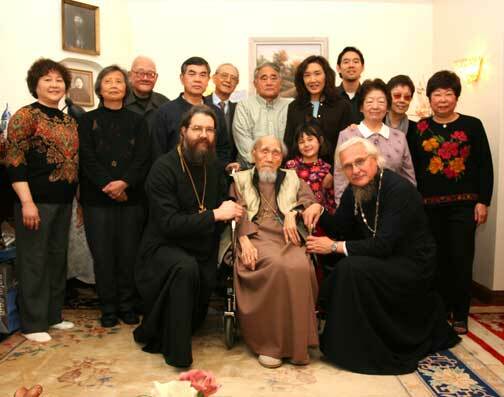 Fr Elias Wen with the Cathedral Archpriests and family on his 110th birthday,November 19, 2006. Protopresbyter Elias Wen ( Wén Zǐzhèng in Chinese) was born in Beijing, China, in 1896. At the age of seven he on his own volition and with his parents permission was baptized into the Holy Orthodox Church. From 1905 to 1914 he studied at the Mission school and from 1915 to 1918 at the Beijing Theological Seminary. In 1931 he was ordained to the priesthood by Archbishop Simon and assigned to the Annunciation Church in Shanghai. After completion of the new Shanghai cathedral in honour of the Mother of God "Surety of Sinners", Fr. Elias was assigned Dean there. In 1946 by Decree of Archbishop John (Maximovitch) he was made Rector of the cathedral. Soon afterwards because of the communists Fr. Elias was forced to flee China. He ended up in Hong Kong where he founded the Resurrection parish. Fr. Elias did a great deal in Hong Kong to help the numerous Russian emigres. In 1957 Fr. Elias made his final move, to the US, where he was assigned to the Holy Virgin Cathedral "The Joy of All Who Sorrow" in San Francisco. "Archpriest Elias Wen began his service to the Church at a young age at the Russian Ecclessiastical Mission in Beijing. It is with zeal and diligence that he continued his service at all levels in Shanghai. Faithfulness, steadfastness and a blameless life characterized Father Elias' life as a priest. It is with these fine qualities that he ministered to the Hong Kong community in the course of the last eight years." In 1981 by Decree of the Synod of Bishops of the Russian Orthodox Church Outside of Russia Father Elias was elevated to the rank of Protopresbyter. In 1996 Father Elias' 100th birthday was marked by the Cathedral parish. Many people remarked how Father Elias was able to, in very difficult circumstances, to bring up seven children and provide them with an education. The results of his labors were evident: his children surrounded him with respect, love and care. After 1996 it became difficult for Father Elias to serve. He continued to bring joy and comfort to the parishioners by attending services, praying in the altar and receiving Christ's Holy Gifts. At the end of 2000 he moved to his son Michaels' home and was unable to attend services any longer. He was communed on a regular basis at home. On Saturday, June 9, 2007, Protopresbyter Elias Wen fell asleep in the Lord at the age of 110. He was the eigth oldest man in the world. His mind remained clear until his repose. He was born in the 19th century, baptized in the 20th century when the Russian Church was undivided. He survived the division in the Russian Church and the takeover of his Homeland by communists and reposed in the 21st century. By God's mercy his repose took place a few weeks after the Russian Church became one again.